Boots, Barclays Bank, Co-operative, Dewhurst, David Mobbs and H.O. 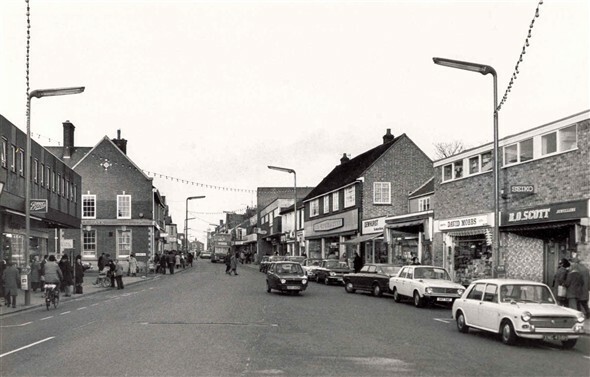 Scott, High Street, Gorleston, 9th December 1977. For sometime in the 1950s as a young lad I worked for W. Ames builders. I was employed in the depot of Norfolk plant hire heavy construction machines at the old tramways at the bottom of the Gorleston High Street; which is now I think is the library. On a recent visit in 2012 I saw many changes to I quote 'sleepy old Gorleston'. Needless to say many the times the traffic had to be held up in 1950s when our ex army converted low loader lorry with an excavator plus one or two cement mixers pulled out of the tramway building, as the saying goes because of holdup not one bus but two came along. Yarmouth was in the time of row clearing plus bomb damaged areas, also on South Quay new flats and maisonettes being built. Unlike today more people were employed in the building trade by private builders and most local firms i.e. H. A. Holmes, W. Ames, & Carters to name a few. Sadly the rise of self employed tradesmen has seen the end of the great building firms but Yarmouth and Gorleston had the best developments to date again Shrublands, Magdalen Estate, and South Quay etc. I hope future growth goes on. There used to be a small Woolworths further down the photo on the left. Also there was the old library which had a clock outside.